American-style globalization has reached its natural limit, which brings about ‘Trumponomics’ aimed to preserve American leadership from rising challengers, while the national interest turns into the absolute of the US policy. Globalization, which used to be an inherent trait of American leadership, no longer serves American interests, facilitating the rise of global pretenders. 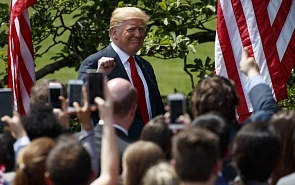 In a bid to reverse the trend, the US administration took on the policy called ‘Trumponomics’, which manifests itself in protectionism, foreign policy based solely on the national interest, and the number of economic measures directed to bring back American wealth, and boost GDP growth through a fiscal stimulus and massive investments in infrastructure. The side effects of this policy are trade wars, globalization slowdown, and allies rapidly becoming competitors in a leadership battle. What is behind the ‘Trumponomics’? Is there any chance to succeed? What is the scenario for the trade wars? Find the answers in a new Valdai Paper by Alexander Losev, acknowledged market analyst and chief executive officer at Sputnik Asset Management. Globalization no longer serves American interests. In a bid to reverse the trend, the US administration took on the policy called ‘Trumponomics’, which manifests itself in protectionism.